From tweaking headlines on landing pages to swapping out entire design concepts, A/B testing can mean a lot of things. For our clients, it means increasing conversion rates in a measured, repeatable, data-backed way that impacts the bottom line. From page design and layout to testing various offers, landing page optimization helps our clients meet their prospects with the best offer and best experience, right when it’s needed most. Mapping the user’s journey through our clients’ digital properties is just step one of funnel optimization -- and that journey is rarely linear. We help our clients move prospects through the funnel with our best-answer strategy, from the first visit to lead conversion. Ongoing, data-driven optimization of content isn’t simply for search engine optimization. We help our clients optimize their content for conversions, based on the stage of the funnel, existing conversion data, heat mapping and more. If you have a high-volume website and want to more quickly identify opportunities for conversion, multivariate testing can help you get there. We help our clients test multiple variables at the same time to determine which changes will help achieve their lead generation goals based on solid, reliable data. We help our clients leverage data to determine how, why, where and when their prospects are engaging with their digital assets throughout the funnel. Then, we use that data to iteratively improve the users’ experience at every point of contact. Last summer, we partnered to give the site a fresh look and improve the user experience. And as has been the case for more than a decade, we’ve been implementing monthly SEO recommendations and refining the conversion path as opportunities have arisen. 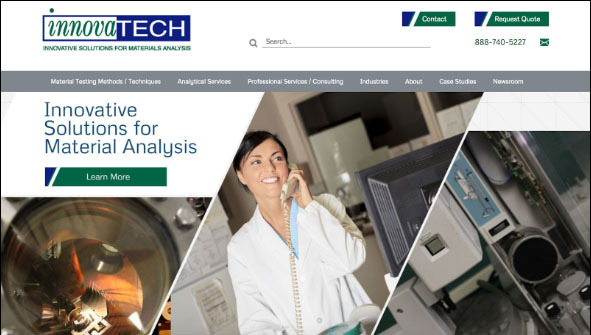 Learn how an always-on approach to optimization exceeded expectations for Innovatech Labs. Leave the vanity metrics behind. It’s time to get down to the business of increasing your MQLs in a way that’s backed by data. What would happen if….? That’s a question we are continually asking of our client’s digital performance – which is the heart of our conversion rate optimization services. A/B testing allows us to move the needle for our clients in a safe, data-informed way that won’t negatively impact conversions in the short term. Landing pages are often the first impression that a prospect has of your brand. We use various data collection techniques, along with a strong foundation in industry best practices to optimize landing pages for maximum conversions. Many marketers have an idea of where their assets fit into their digital ecosystem. It’s our job to continuously define and refine the funnel based on actual user interactions. We confirm how your prospects interact with your digital properties. We identify the next steps in the funnel. Then, we create and implement strategies to move them through the funnel FASTER. From stale CTAs to under-utilized conversion points, if you’re not constantly optimizing your content for conversions, you’re missing opportunities. Our team of experts continuously optimizes top performing content for conversions with a mix of user experience updates and A/B testing to determine the point of maximum impact. Testing multiple variables at the same time is a great way to increase conversions in less time – as long as your site has the amount of traffic to produce a conclusive test. We help our clients determine if this is the right tactic for their site and manage testing from design, layout, and content through to implementation and measurement. Search engines like Google use user interaction as a metric for website credibility and ultimately rankings. We help our clients understand the user flow on their websites – where the points of conversion are, what’s standing in the way, and what can be improved to help reach their conversion goals.